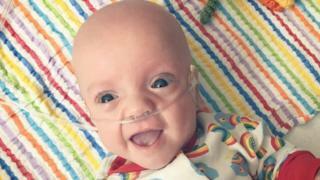 A baby born at 25 weeks and chosen as the face of a £2m hospital campaign has turned one and is home for Christmas. Arlo Watson, of Broseley, Shropshire, was the size of his mother's hand when he was born on 14 December last year. Birmingham Children's Hospital warned the family he may not survive and he spent almost 200 days in hospitals. He is now set to spend his first Christmas at home and his family are planning a special thank you, making hampers for hospital staff and parents. Laura Watson and husband Sammy, both 29, have made eight hampers they will give to staff and parents of premature babies who this Christmas will be at the hospitals where Arlo was treated. They have also bought 117 baubles as gifts for the tiny babies. Arlo was chosen as the face of the £2m Birmingham Children's Hospital Critical Journeys Appeal, to kit out four ambulance vehicles. And despite a tough start in life, his family say he is now doing well. Image caption Arlo, on the night he was born. His mother said: "His skin was shiny and wet looking, his eyelids were still fused shut and he had no eyelashes or eyebrows." The Watsons have two older sons, five-year-old Reuben and two-year-old Rowan. Though Rowan was also born slightly prematurely, Laura said she had had no idea what was going to happen and Arlo had been classed as a low-risk pregnancy. The pub worker said: "I did have a niggling feeling that he was going to be early, but not that early. "At work the night before I felt really rough and the next morning I woke up and had a bleed, that was why I went in." At Princess Royal Hospital in Telford, she was found to be 4cm dilated and sent to Wolverhampton's New Cross in the hope steroid treatment might prevent Arlo's early arrival. But it was not the case and he was born weighing just 755g (27oz). Despite his unplanned arrival, the hospital felt he was doing well and sent him back to Telford. But at six weeks old he got a serious bowel infection and needed ventilation to keep him alive. Mrs Watson said: "We were asked if we would like to have him baptised because they didn't think he would last the night. " Once stable, he was taken to Birmingham Children's Hospital where he had two operations on his bowel, leaving him with a stoma. He spent most of February in a critical condition, but was then returned once again to Telford's hospital where he was prepared to go home. But problems with his stoma meant he was taken back to Birmingham Women's Hospital where he stayed for two-and-a-half-months. In total he spent 198 days in hospitals, finally going home in July. Arlo touched hearts online through a Facebook page Laura first set up as a way to keep friends and family updated with his progress. The Adventures of Arlo River now has more than 3,000 followers. Mrs Watson said: "It has been a real comfort, particularly in the most difficult times, to know how many people are thinking of him." She said finally getting Arlo home had been a mix of emotions. "But it is surprising how quickly you adapt to the new normal." Though Arlo no longer needs his stoma, he is still on oxygen due to chronic lung disease caused by his early birth. It is hoped it can be reduced and he will be fully recovered by the time he is 12. To celebrate Arlo's birthday and his first Christmas at home, the family have set up a fundraising page for the four hospitals that treated him and will be putting their hampers in each staff room and parents' room. Mrs Watson said: "It is a chance to say thank you to the hospitals. And do something nice for the parents because we know what they are going through."